I’m not predicting a championship with team full of hypothetical rookies, but I’m very excited and on board to ride with a new true underdog! Congrats to Philly on making this trade in order to acquire the #1 pick! I expect big things and major surprises from this team going forward. There’s still a few things that’ll need to be addressed. I’m only concerned about the defensive end of the floor. They’ll need to acquire another defender or two and they may be able to give many top teams a great challenge. I’m not going to expect injury, I’m not a pessimist at all. I’m truly so optimistic that it sickens those around me at times. I’ll carry that attitude into the season with the Philadelphia 76ers. Of course once the off-season gets fully underway, I’ll expect them to get a couple veterans to teach this group how to be professionals and how to prepare. 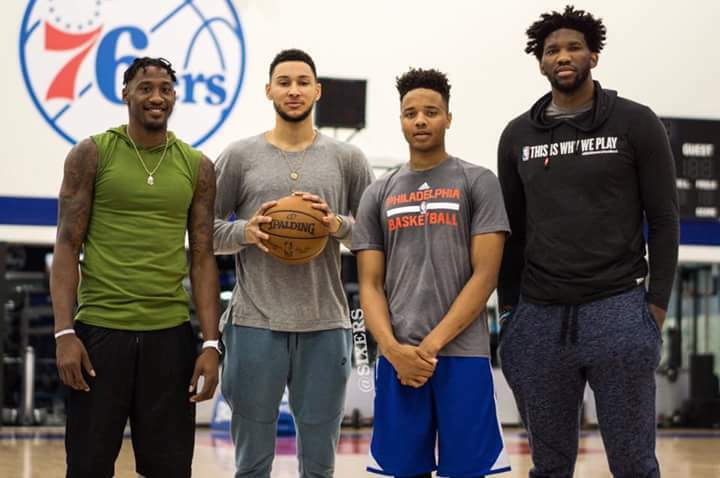 It doesn’t hurt that they’re very talented already individually and that even Ben Simmons has a legendary tutor. We all know who. Let’s hope Robert Covington can continue to elevate his game as well. I can’t wait to see if they move the ball the way I believe they definitely can. Coaching will become a factor as well but I expect it to be a success. The only real question I have now is, “Does Philly keep Jahlil Okafor?” They could flip him for a couple good players that’ll help develop these young players into very good players early. They could flip it into those defenders I speak of as well. They do have Dario Saric at the 4, so do they need Okafor? Then again, they could just use Okafor off the bench and maintain an advantage that many teams don’t have: having multiple scoring big men. I don’t want them to land any veterans that’ll take away from the young players development. I see them developing like the Rose-Noah-Deng-Gibson Bulls, the Durant-Russell-Harden-Ibaka Thunder, and they could become the Steph-Klay-Dray of the East but with a much different twist. I hope Fultz and Simmons turn out to be as anticipated out the gate! That’ll definitely cause matchup problems galore with “The Process” having distance shooting and post presence apart of his arsenal. If Ben Simmons can be a force on the defensive end along with his court vision and passing abilities, with Embiid rim protecting, they really could shock the league. It’s about time Philadelphia! Congratulations! It’s on now! Long live Hinkie! Go Sixers!